Distracted Driving in Oregon: What Laws are Being Considered? 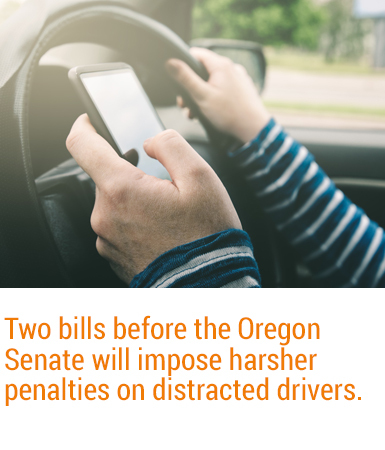 Driving while distracted by mobile devices has become an increasingly serious issue in Oregon and across the nation. The Corson & Johnson Law Firm has many catastrophic injury cases that were caused by distracted driving. In fact, some of the victims in these cases died as a result of drivers paying more attention to their phones than the road. The problem is only getting worse. Let’s take a look at the new laws Oregon lawmakers are considering. Increasing the scope of the law to include not just communication devices, but any mobile electronic device. Increasing the maximum fine for the first offense from $500 to $2,000. Adding a penalty for a second offense to be up to six months of imprisonment and/or a maximum fine of $2,500. Adding subsequent offenses that could lead to one-year imprisonment and/or a maximum fine of $6,250. Allowing first-time offenders to take a distracted driving course to avoid the fine. As of April 2017, SB 2 A was referred to the Senate’s Ways and Means Committee. HB 2597 has no penalties involving imprisonment. A first conviction would result in a Class B traffic violation and a maximum fine of $500. Second and subsequent convictions within a 10 year period result in a Class A traffic violation and a maximum fine of $2,000. On May 1, 2017, the House passed the bill by a vote of 46 to 13. The Senate Judiciary Committee held a public hearing on HB 2597 on May 24, 2017 and the bill was subsequently referred, without recommendation, to the Senate Rules Committee on June 6, 2017. If approved by the Senate Rules Committee, HB 2597 will be sent to the Oregon Senate for a vote. If passed, the bill will go to the governor for signing. If the bill is not approved, the bill will go back to the house for further revisions. As this issue has been declared an emergency, HB 2597 would go into effect as of October 1, 2017. How Do You Feel About Distracted Driving? With these bills still under Senate review, Oregon residents still have the opportunity to voice their opinions. We encourage you to contact your Senator and let him or her know how you feel about SB 2 A, HB 2597 and the distracted driving issue. We all need to work together to make Oregon’s roads safer. This entry was posted in Blog, Car, Motorcycle, and Motor Vehicle Collisions. Bookmark the permalink.